Hitachi Zosen Inova to build the largest energy from waste plant in Dubai in collaboration with BESIX Group. Covanta Energy LLC acquired Palm Beach County Florida energy-from-waste facilities which are anticipated to showcase healthy growth of the organization. Energy at waste-to-energy plants and in some cases landfills is produced by garbage, also known as MSW (Municipal Solid Waste) which comprises of biomass from agricultural, animal or plant waste such as wastes by grass, wood, paper, leaves and leather products among others. Burning of wastes have a big hand in reducing soil pollution as it reduces the capacity of waste that would possibly be submerged in landfills. Biological machineries are anticipated to gain noteworthy market share over the forecast period. Waste to energy finds its usage in producing heat or electricity directly by combustion. It is a process of generating energy with help of bacterial fermentation from major treatment of waste. Waste to energy also produces combustible fuel properties such as synthetic fuels, ethanol, methane and methanol. It uses method of biochemical expertise and modern day combustion techniques to recover energy in form of electricity, steam or heat from urban wastes. Depending on the use of outputs and composition, a major volume of original waste is reduced by these new technologies. Increasing demand for electricity and high dependency on renewable sources to generate energy due to depleting petrochemical reserves is likely to drive waste to energy market with a CAGR of 5.7% over the period 2016-2024. MSW (Municipal Solid Waste) management programs adopted by regional governments to promote power generation will further boost the revenue of the global waste to energy market to USD 42,520.4 Million by the end of 2024 from USD 27,290.0 Million in 2016. 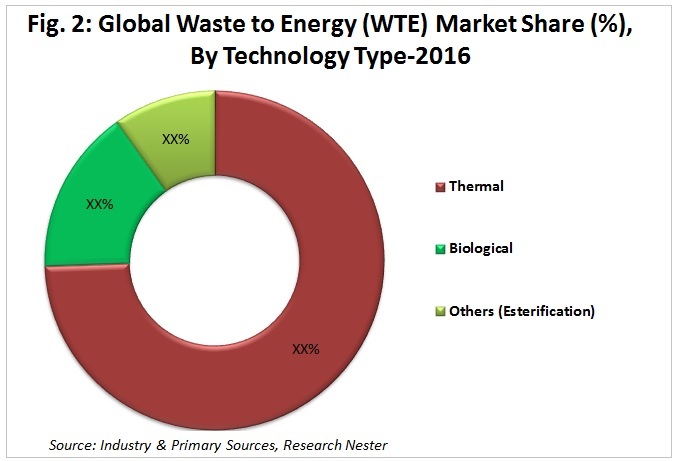 Global waste to energy market is segmented on the basis of technology into thermal, biological and others, out of which, the thermal technology segment is expected to achieve Y-o-Y growth rate of 6% in 2024 and is further sub segmented into incineration, pyrolysis and gasification. Among these segments, incineration technology segment is dominating the market owing to the low cost operation. Moreover, factors such as rising urbanized population and increasing waste generation globally are driving the waste to energy market. However, biological method of energy management is anticipated to show robust growth over the forecast period owing to the high penetration of various techniques such as anaerobic digestion and gas capture through landfilling. Additionally, biological waste to energy technique generates relatively low harmful emissions which further are expected to fuel the market growth of waste to energy over the forecast period. The increasing demand for renewable source of energy is expected to propel the demand for recycling and combustion for energy recovery resulting in the growth of the waste to energy market in upcoming years. Renewable source of energy is a cheaper alternative to most traditional sources of energy. Various emerging countries such as China and India have been developing energy through renewable resources in order to reduce carbon footprints. Additionally, various developed countries have been involved in extensive R&D activities to develop low-cost waste to energy technologies. Further, the renewable energy has stabilized global energy prices. This is because of the cost of renewable energy that depends on the initial cost of installation of renewable energy technologies in comparison to other energy plants such as fossil fuels etc. Furthermore, reducing waste generation and also promoting reuse and recycling of wastes are some of the various factors that are anticipated to fuel the growth of the waste to energy market over the forecast period. Strategically planned waste minimization and green procurement programs leading to more sustainable consumption patterns along with economic development are also believed to aid the global WTE market to grow in near future. Various factors such as high operating cost and low adopting of waste to energy plant in Middle East and African countries, requirement of large land areas combined with lack of public understanding are anticipated to restrain the growth of the global waste to energy market over the forecast period. 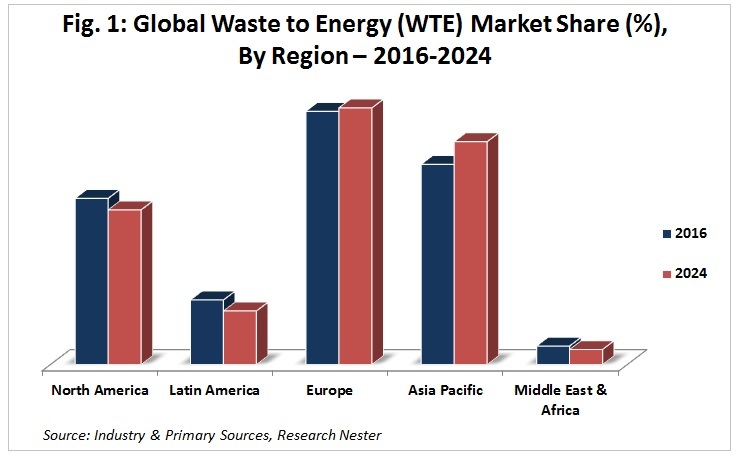 Some of the affluent industry leaders in the global waste to energy market are C&G Ltd., Amec Foster Wheeler, Veolia Environment, Suez Environment S.A., Waste Management Inc., Keppel Seghers, Babcock & Wilcox Co., Covanta Energy Corporation, Hitachi Zosen Inova AG and ADI Systems Inc. Some companies are investing highly in research and development activities to expand their product line offering which in-turn will help the companies to establish strong foothold in the market. For instance, Veolia Environment is highly investing in research & development in order to develop and sell innovative products. Moreover, several waste to energy companies are continuously looking for potential acquisitions to strengthen their position in the market along with efficiently working on recycling and reusing the waste.